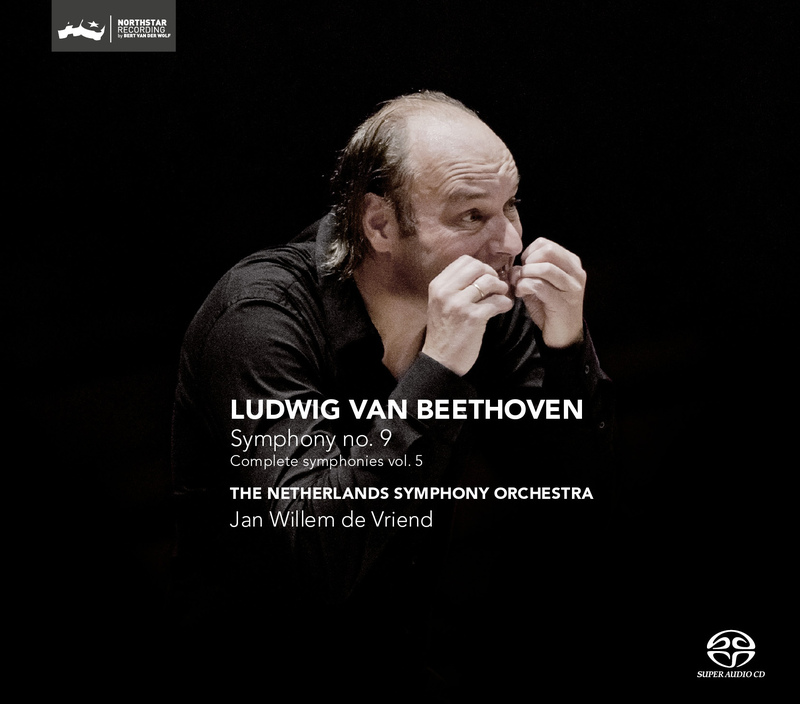 This is the last cd in the series of the complete Beethoven Symphonies performed by Jan Willem de Vriend an his Netherlands Symphony Orchestra. With every cd in this volume De vriend has shown his fresh view on Beethoven, which has with every volume resulted in a indeed fresh sound and also a profound rendering of these famous works. From the linernotes with this cd;Although his behaviour did not always show it, Beethoven’s ideal was definitely that all people would be equal. (This is why Schiller’s text appealed to him at such a young age.) After all, it is often the case that people who have an ideal to which they devote themselves, with which they feel great affinity, are absolutely unable to attain it in their daily lives. There is something appealingly human about the fact that Beethoven had big ideals for himself – and for humanity – and that he could not integrate them in his personal life. But he could use the ideals in his work, he could unleash a musical revolution. Is it not moving that in the work of this man, who was such an earthy person, the divine spark can be observed so clearly? Beethoven will always continue to fascinate people. Whether you adore him, admire him, criticise him or find him abominable, friend and foe must agree that he played a major role in the history of music. Even today, when we hear his symphonies – and surely the Ninth – we can do nothing but agree that it is masterly music. Jan Willem de Vriend does not think that he is ‘finished' with Beethoven now that he has recorded all the symphonies. He will continue to philosophise about them, analyse scores and try to get the character of the era in focus – an ongoing and in-depth process. No, we are never finished with Beethoven! ADVISE if this CD the one featured on the BBC Radio 3 today....with so much praise for the choral part of no.9...Challenge Classics mentioned in the program. New CD? "The DSD recording sounds very open and natural, with lots of clear, clean detail." "the result is a performance of this masterpiece of which he has its full measure"
This is a tremendous and remarkably revealing performance of Beethoven's Symphony No. 9, and with the added bonus of SACD surround sound it is also a genuinely spectacular sonic experience."